What are holiday foods that are not safe for cats? How do you prevent your cat from ingesting something toxic and what do you do if it happens? Holidays and food go hand in hand. All year long, we look forward to the festive spread of turkey, gravy, mashed potatoes and cookies … lots of cookies. 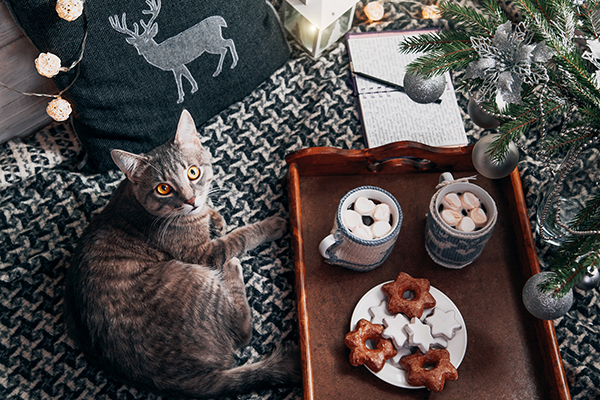 Munching on these holiday goodies could have some adverse effects on our waistlines, but the impact of these human holiday foods on our cats has far worse possibilities. 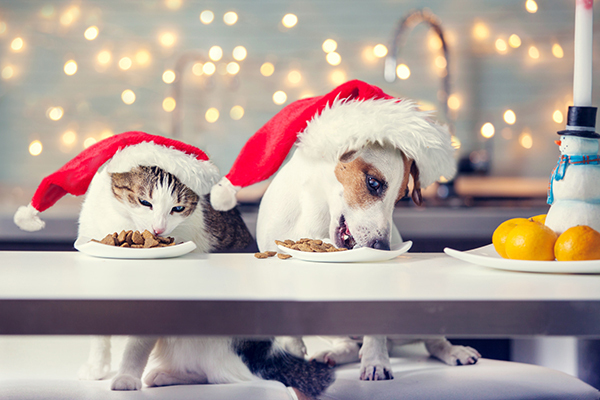 Take a look at some holiday foods that are not safe for cats, how to prevent any holiday food mishaps and what to do if your cat does ingest something potentially toxic. Is that holiday dish safe for cats to eat? Consult our list below. Photography ©TatyanaGl | Thinkstock. Turkey with spices. We often enhance the taste of turkey with spices, many of which don’t mix well with kitty’s system. If you do want to share a tiny bite of turkey with your cat, make sure it’s completely free of spices. Turkey grease. Cats who ingest turkey grease, which is highly attractive to a cat’s taste buds, may experience diarrhea, vomiting and — more seriously — pancreatic inflammation. Garlic and onions. These ingredients add zest to human foods, but cause digestive upset when eaten by cats. Eating onion on a regular basis has been known to cause anemia in felines. Raisin breads and puddings or salads that contain grapes. Cats don’t usually seek these foods, and thank goodness because they can cause acute kidney failure. Alcohol. Like humans, cats can get drunk and even suffer alcohol poisoning and liver failure. Keep those cups of spiked eggnog out of reach! Poultry bones. These small bones (especially ones from chicken) may get stuck in a cat’s digestive tract and cause fatal damage. Chocolate. We can’t imagine the holidays without tasty indulgences like chocolate. Although this dessert and treat ingredient is a crowd pleaser for the human set, it’s a definite no-no for kitties. Chocolate contains theobromine, a potent cardiovascular and nervous system stimulant which is eliminated slowly in cats. Important to note: This list is not exhaustive. For a more comprehensive list, check out the people foods to avoid feeding pets on ASPCA.org. Cats are curious, stealthy and sometimes unpredictable — it can be difficult enough to track their moves during the daily routine of life. Add the chaos of the holidays and it’s nearly impossible. Visitors arrive and everyone eats, drinks and enjoys the holiday spirit. It’s only natural that people would leave plates of food and drinks on coffee tables and countertops, giving unattended kitties an open invitation to help themselves. Place a note on your main serving table asking guests not to feed human foods to your cats. Remove abandoned drink cups and plates containing food scraps. Put leftovers away as soon as possible. Take garbage bags out as soon they become full. Place your kitty in a room behind a closed door if he’s likely to go after human food — or simply skittish around guests. Teach your cat that counters and tabletops are off limits all year round. This will lessen the likelihood of counter cruising during holiday gatherings. Make a habit of saying no if your cat begs for scraps. Feed your cat prior to preparing holiday foods so he’s not looking for handouts later. If you see your cat has eaten possibly toxic food or is showing symptoms like diarrhea, vomiting, lethargy or anything else out of the ordinary, contact your vet. It’s an excellent idea to have the contact information for the closest 24-hour emergency clinic posted in a central area, like on the refrigerator. If you have a question about a particular food, call the ASPCA Animal Poison Control Center: 888-ANI-HELP or 888-426-4435. Thumbnail: Photography ©Maryviolet | Thinkstock. Thanks for the reminders we need to keep all our Pets safe regarding food ingestion and know which foods are unsafe any time of the year. Always a good reminder. Our cats are an integral part of our family and will be that way for (hopefully) many years to come. Our best to fellow Catster readers for a great Christmas and a rewarding 2019 for people and felines alike!